I am very grateful the cycle path is along the main road from the Weaver’s Shed to the crossroads at Shepreth. 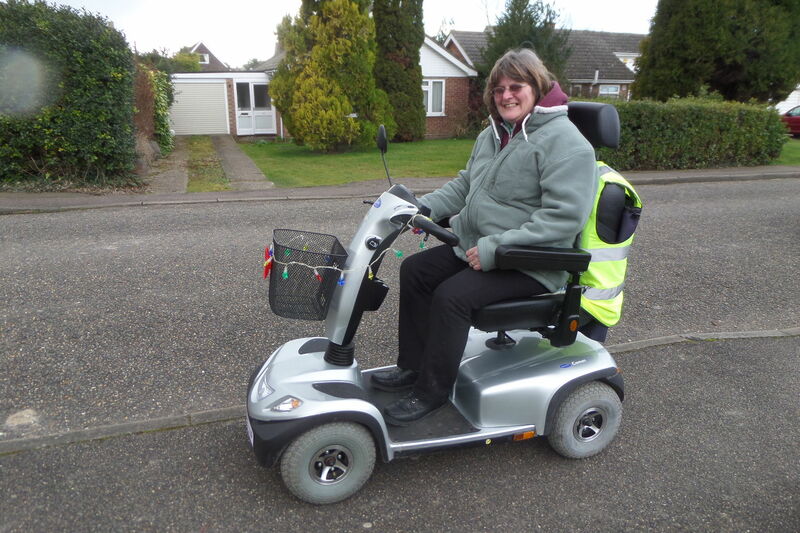 As a mobility scooter user it makes getting to my mother’s at Fowlmere so much easier. If I went the back way past the Bird Reserve the drivers of cars would not be happy. I would love to be able to get to Royston on my scooter but would be very scared of crossing the by-pass. Yes there are buses but on a nice day as I have a scooter I would rather use it. I would also be able to get to my doctor’s at Burns Road so I could get an appointment any time rather than time it with the buses. I am for a safe passage from Melbourn to Royston using my scooter as I love to get out rather than stay in. The new sections of path are welcome, but a couple of short intermittent sections do not make a route desirable or even possible. “Last Friday as I cycled South from Cambridge on the A10 at about 5pm, I got shouted at not once but twice in one hour by motorists who told me to use the ****** cycle path. Going up to Cambridge, or coming back in daylight, I use the A10 cycle path, even though its generally poor condition makes the ride slower and less comfortable. But most of it is narrow, rutted, potholed, and over-grown by low-hanging trees and trailing brambles. In winter weather the path can get littered with debris. And cycling South after dusk, into the face of oncoming traffic, I can see none of this, as the cars’ dipped headlights shine right into my face, blinding me. Cycling South on the footpath after dusk is, in short, incredibly dangerous. I can get off and walk, or risk cycling into a ditch or tree, or risk hitting an obstacle and ending up in the road. Cycling North after dark is not a lot better, but at least then the cars behind you light up most of the path. Not all … but most. So I cycle on the road, as do many others. And occasionally get sworn at for it. Which is upsetting, but is also frightening as a few drivers slow down to shout at me. They are taking *their* eyes off the road, in the dark, in order to tell me off. I drive enough to know that is not safe. The vast majority of drivers are careful, courteous, give a well-lit cyclist lots of road room, and show no resentment of having to share the road with me. I am grateful to them, and I try to reciprocate by keeping out of the way, obeying traffic signs, signalling and so on. But only a vast majority. There are always a few … well, others. So I have three choices (other than to join the drivers). I can take the cycle path and take the 50:50 chance of ending up in a ditch or in front of a lorry. I can ride on a busy road and take the 1:1000 chance of being killed, and the chance of being shouted at. Or I can cycle through Addenbrookes, Shelford, Newton and Fowlmere and avoid the A10 entirely. The country route is 2 1/2 miles longer, dark, winding and without a cycle path at all, but, hey! I don’t get dazzled and I don’t get shouted at. So I have taken to doing that. If those building or repairing cycle paths can help address this, I for one would be hugely grateful, and would happily use the results of your efforts, and leave the motorists in peace to vent their frustrations on a Friday evening some other way.